One of the basic things I believe you should teach your dog is patience and calmness. 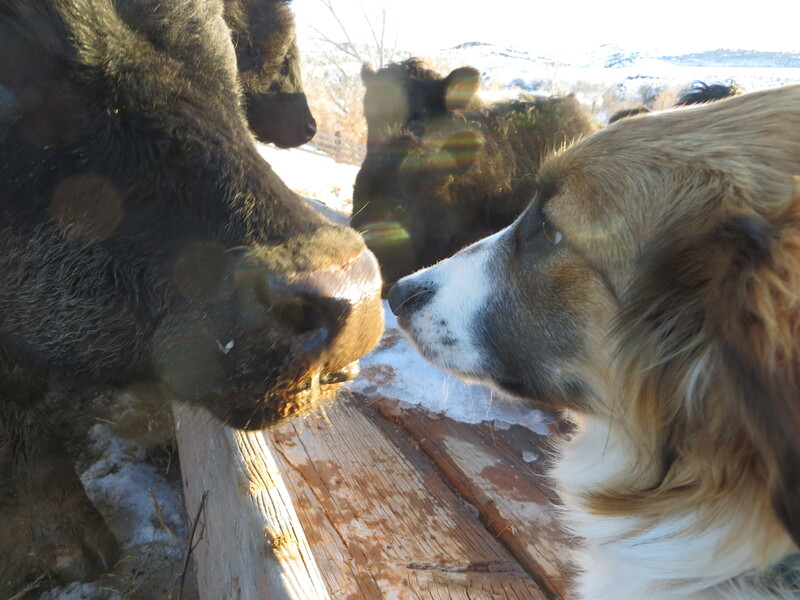 Calmness around livestock is a great quality to have… it’s easier on your dog… and your cattle. While I’ve let Eden go along on some trail drives, I haven’t really WORKED her. She’s followed the other dogs and had a great time… but it’s time we get serious. She has a pretty good recall, a fair “lay down”, a good mark on “checking in” with me (where I’m going, what I’m doing). There have been calves around the house, she was used to them… but now I want to tone that down just a bit. First of all, she shouldn’t be working from fear… “Ah, they’re coming for me! I should chase them away!” Second, she should be able to move through them without too much disturbance UNLESS SHE’S ASKING FOR IT. Enter the Theory of Sitting On Your Dog. I try to teach a variation on this whenever the chance arises… sometimes the opportunity presents itself and we just go with it. Dogs should be able to lay quietly at your feet and last in their DownStay command for a while. For my dogs, that means even if there are cows around! Done right, Sitting On Your Dog teaches relaxation. Put your dog on a leash, grab a chair and a book, sit the chair ON the dog’s leash, with just enough line for the dog to lay down by your side. Read your book. Ignore the dog as best you can (though I usually give a pat or two if she does what I want which is relax). Start with a half an hour… she should be able to lay down and relax without freaking out. This is also patience on your part, hence the book… just read and ignore the dog. The dog has nothing to be gained from freaking out, she should be like the owner and be in Relaxed Mode. So, my position is usually sitting in the hay (it’s hard to lug a chair around right now!). I’m also sitting on the leash. I’m reading. Other dogs are not present. Eden has run and played before. She’s watching Brandon’s bunch. She will be alert, then quiet and lay down… I reward this with a pat and a belly rub which stops when she lifts her head to watch again. That’s what we’re shooting for… though, sometimes this happens instead… I’m trying to clean up the calving shed where I kept the chickens as chicks… soon Brandon will need it for actual calving! Eden gets a bit excited at the bull, he *is* kinda big… and so, I try to get her to be calm. We step through the gate and take a seat in the feed bunk. I don’t have a leash, but she’s staying with me. I chatter away at the heifers, speaking nonsense in a relaxed tone, hoping Eden is getting my message of “nothing to worry about here”. Curious as usual, they come to see us. Eden is watching. She’s ok with this distance, but they continue to close in. Yeah. She doesn’t like this. But I’m talking to the heifer, letting her lick my hand… Eden is still. Nervous. 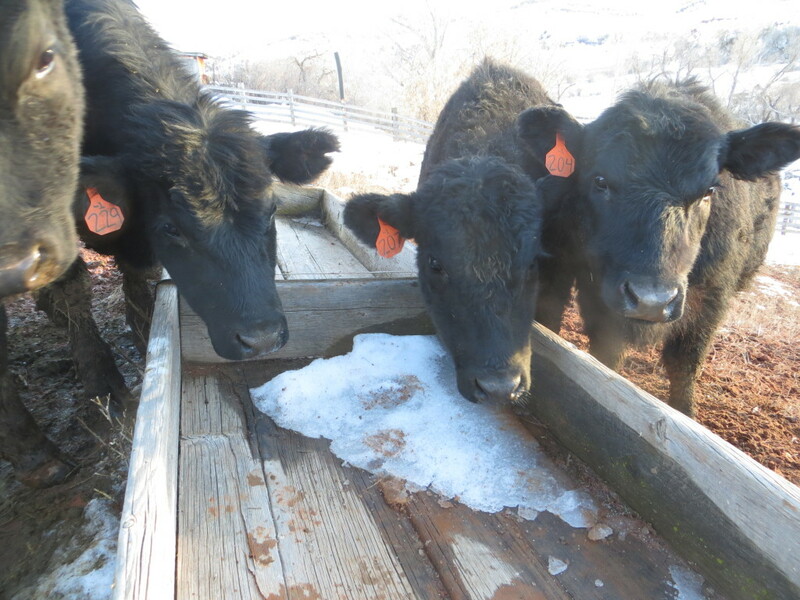 We sit for a bit, and I’m thinking okay, that’s good… then the heifer steps the last bit towards us. Not wanting to spook the heifer or Eden, I still ramble on in a “nothing to worry about” tone. A jump now would ruin the mood. I wasn’t sure who was going to lick who first… see the heifer’s tongue coming out? That was enough! The heifer backed up and I stood. “Okay, enough of that! Let’s go.” Eden was right on my heels and gone. Was it stressful for her? Yes. But working in close proximity to cattle will be standard fair for Eden. Today’s Sitting On Your Dog was through the corral fence, and she was more nervous then. Tomorrow, I’ll back it up some more and see how she is. I don’t expect her to lay down in a corral and let heifers step on her, but teaching her that her bubble is smaller than 15′ is a must! She will come to know these cattle well, and learn a lesson or two, and, hopefully, that will work to her advantage in the future. How old is Eden? I have a 2 year old border collie/Australian shepherd/blue heeler mix. He is very aggressive with our horses. I think he is afraid. Do you think this would work for him? Oh, definitely. Start with a good distance that he can meet that relax mode for at least 10 minutes out of the 30 you are with him, sitting on him. Then move closer gradually so he can learn to relax closer and closer. Don’t push him. I was pushing Eden to put her with the heifers, but she was minding, though not relaxed! It is a good tool and it’s great to read for 1/2 hour while training your dog! Good Eden! Those ears are tucked all the way back and you can see that tension in her face, but she was holding! Great picture…..
Good post Carol. Keep it up. I’m going to try this with our Aussie. He’s almost 6 months old, and has no patience! He’s not going to be hearding, but this would be a good lesson for him to learn. I’ll try it out in the yard with the bird and squirrels that he loves so much. It’s a good lesson. Start maybe just outside your door, not so close to those teasing squirrels!!! 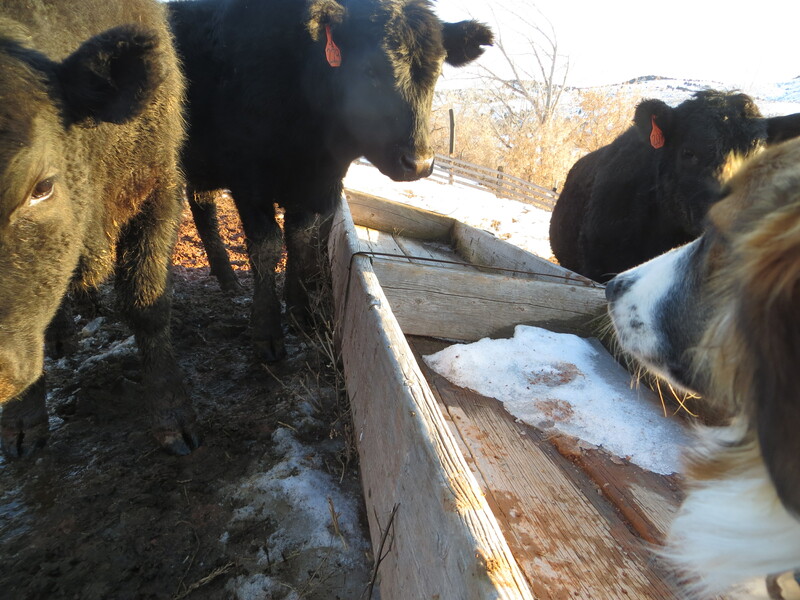 The photo of the heifer about to lick the dog is priceless. Very interesting about how you train the dogs, what patience. KUDOS to you, to Eden, and the calves! Nice story showing calmness, patience, learning, and obedience as the animals get used to each other. I like your strategy….and all the close-up pictures. What a great photo. Eden nose to nose with the heifer. What great patience you have Carol in training your dogs. I always learn something here. Today was no exception. Thank you, Carol.